The World Series of Poker main event in 2003 experienced a number of supporting factors that swelled its number of players to 839, a growth rate of 33 percent over the year before when 631 players competed. The rising popularity of online poker rooms helped supply over 50 players, while satellites at brick-and-mortar casinos around the country supplied many as well. In fact, only 63 players sitting in the main event that year had paid the $10,000 entry fee. One of the online qualifiers sitting in the main event was Chris Moneymaker. He had won his seat by initially winning a $40 super-satellite tournament on PokerStars, and then claimed his $10,000 buy-in in a $600 satellite. At the start of the main event in 2003 he was on the verge of making poker history in one of the most dramatic main events ever. The preliminary events in 2003 provided some drama as well. Doyle Brunson, Johnny Chan, and Phil Hellmuth emerged as the three leading bracelet winners of all time, and each of them won a bracelet in 2003 as well. 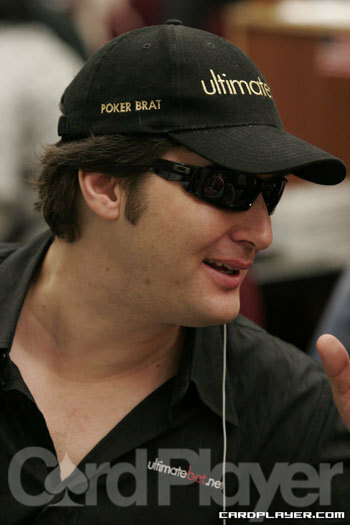 Hellmuth even won two. Brunson picked up his ninth bracelet in the $2,000 H.O.R.S.E. event, Chan won his eighth bracelet in the $5,000 no-limit hold’em event, and Helmuth took home titles in the $2,500 limit hold’em event and $3,000 no-limit hold’em event to produce bracelets eight and nine. Other double bracelet winners in 2003 included Layne Flack ($2,500 Omaha eight-or-better -- $1,500 limit hold’em shootout) and Men “The Master” Nguyen ($5,000 seven-card stud -- $1,500 ace-to-five triple draw lowball). Moneymaker began solid in the 2003 main event. As 454 players were eliminated during day 1 he quietly built his stack up to 60,000, and on the second day he built it as high as 180,000 before both Chan and Phil Ivey were moved to his table. This slowed him down and knocked his stack back down to 100,000. Moneymaker had a seat at the ESPN television table on day 3, which was rigged up with hole-card cameras, so viewers at home could see the player’s cards when the tournament was broadcast a few months later. Chan was seated at that table with him, but Moneymaker eliminated him right before the dinner break. He cotniued his strong run on day 4 when he eliminated Humberto Brenes and Dutch Boyd to take the chip lead. Of the 10 players that remained when play reached the final-table bubble at the end of day 4, Moneymaker was one of them, as was Ivey, who had crossed paths with Moneymaker on day 2. Moneyaker opened the action in a pot with Ivey for 60,000 and Ivey made the call along with Jason Lester. The flop was dealt Q-Q-6 and Lester checked. Moneymaker bet 70,000 and Ivey called. Lester got out of the way; folding pocket 10s, and the turn was dealt 9 . Moneymaker bet 200,000 and Ivey raised all in. Moneymaker made the call and flipped over A Q . Ivey turned over pocket nines for a full house, but the river fell A to give Moneymaker a larger full house and send him to the final table as the chip leader with 2.3 million. 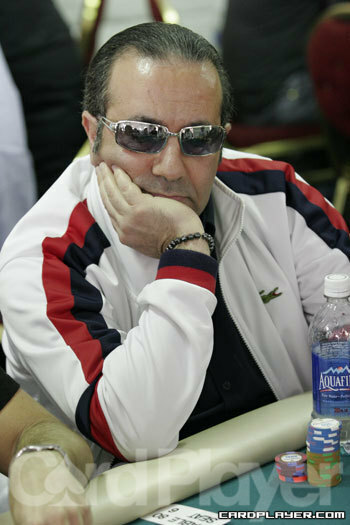 Joining Moneymaker at the final table in 2003 was an impreesive group that included Lester, David Singer, David Grey, Yong Pak, Amir Vahedi, Tomer Benvenisti, Dan Harrington, and Sam Farha. Singer (ninth), Grey (eighth), and Pak (seventh) were the first three players to fall while Moneymaker remained relatively quiet with the lead. Farha held just under a million less than Moneymaker to start with, but his approach was quite the opposite, as he played many pot. He tangled in a large hand before the dinner break with Vahedi, where he scored 420,000 off of him. Vahedi had taken a large hit to his stack a few hands earlier courtesy of Lester, and the two hands left him with 1 million less than he started. He was knocked out a few hands after the dinner break by Farha in sixth place, which gave Farha the chip lead. The next major action saw Moneymaker eliminate Benvenisti in fifth place and he wasn’t done there. Moneymaker raised to 100,000 preflop and Lester reraised to 450,000. The flop brought 10-9-8 and Lester moved all in. Moneymaker made the call and flipped over Q-J for the nut straight. Lester held A-Q, and he was eliminated in fourth place when no help came on the turn or river. Moneymaker went on to knock out Harrington in third place and he took a two-to-one chip advantage into his heads-up match with Farha. The first major hand between the two players heads up is one of the greatest bluffs in WSOP history. Moneymaker raised preflop to 100,000 with K 7 and Farha made the call, holding Q 9 . The flop was dealt 9 6 2 and both players checked. The turn fell 8 and Farha bet 300,000. Moneymaker raised to 800,000 and Farha made the call. The river was dealt 3 and Moneymaker moved all in. Farha went into the tank for several minutes and seriously considered a call. He did not though, and mucked his cards. The successful bluff gave Moneymaker 6.6 million and took Farha down to 1.8 million. On the final hand Farha raised to 100,000 and Moneymaker made the call. The flop was dealt J 5 4 and Moneymaker checked. Farha bet 175,000. Moneymaker and Farha moved all in. Moneymaker made the call and they flipped over their hole cards, Moneymaker held 5 4 , while Farha held J 10 . The turn missed both players, but the 5 on the river improved Moneymaker's hand to a full house and made him the world champion. To call his win revolutionary would be an understatement, as an amateur poker player named Moneymaker winning the biggest poker tournament in poker and $2.5 million proved to change everything.